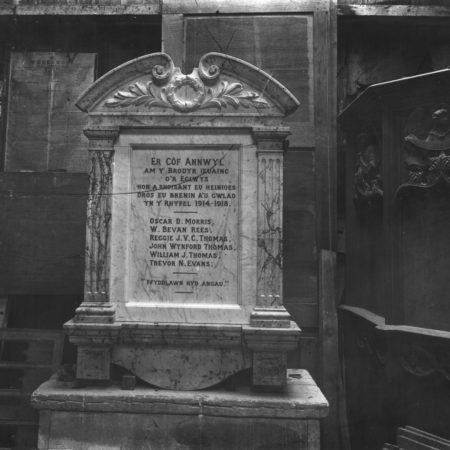 The project started in November 1919 when Greg (Harry Gregory) made scale drawings of the monument, which suggests that the design may not have been Clarke’s. 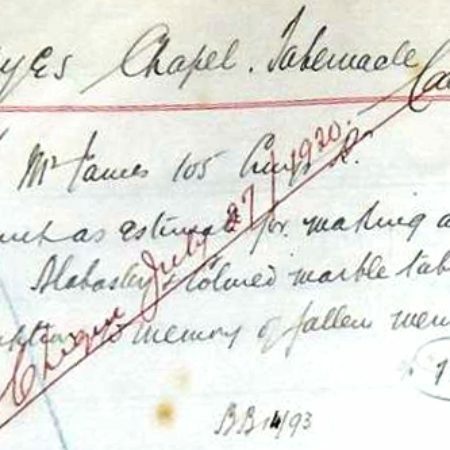 Work on the tablet itself commenced in May 1920 and was completed by late June. The day book records of its construction, which are rather more concise than usual, show that about 332 man hours was spent on the job. S. P. (Sidney Pollard) and Dando, together with unnamed masons with help from unnamed labourers were responsible for construction, with Ellis undertaking the carving and (Henry) Durnell the inscription. 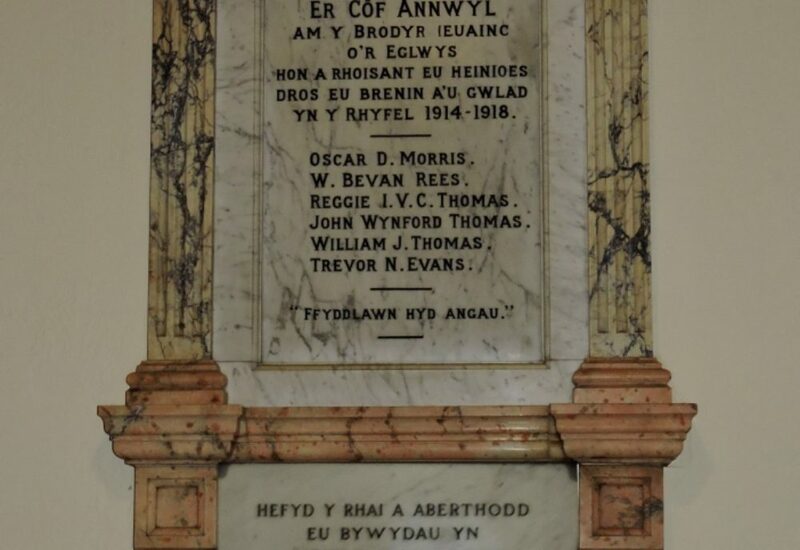 Dando and Horsley were responsible for fixing the memorial in place. Sharpening tools was contracted out to B. Jenkins. 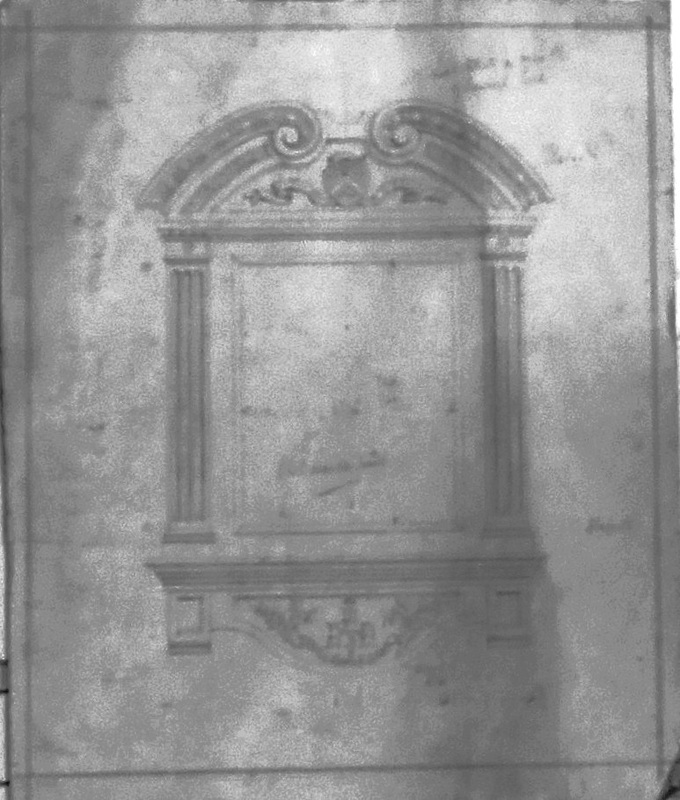 The only surviving drawing relating to this project is in a very poor state of preservation and is certainly not a scale drawing. 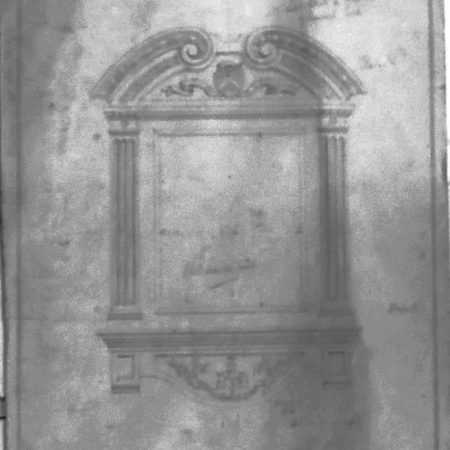 It may be a tracing of the original supplied by an architect; Figure 2. Total day works, materials and sundry expenses came to £71:14:0. 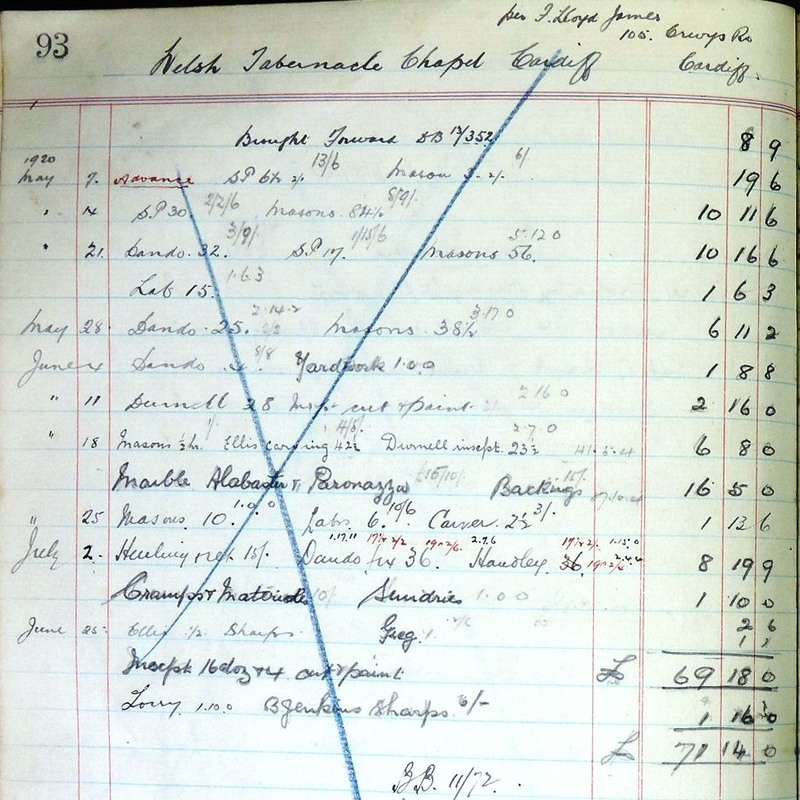 F. Lloyd Jones of 105, Crwys Road, Cardiff was billed £100, representing a profit of 40%. A photograph of the completed item taken in Clarke’s workshop has survived; Figure 3. 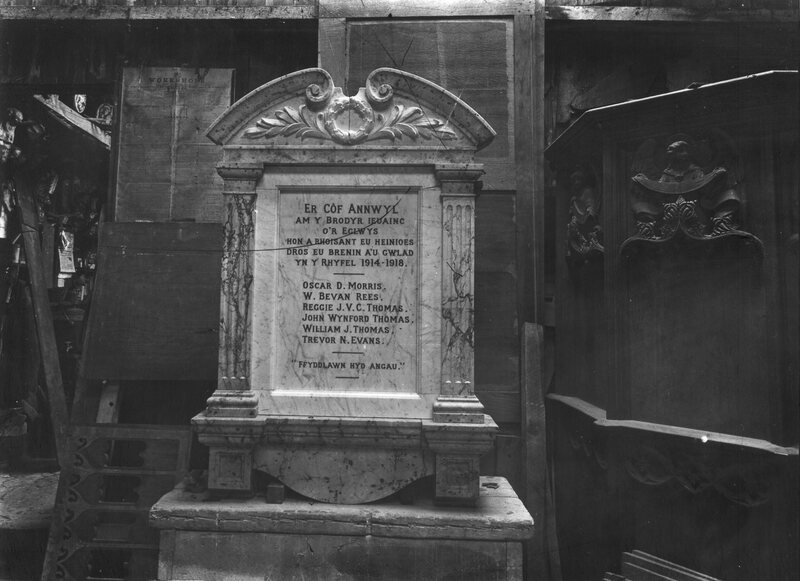 A comparison of Figure 2 and Figure 3 shows that the bottom member of the memorial between the two corbels was originally to be decorated but in the final version this piece was left plain.. A comparison of Figure 1 and Figure 3 shows that in order to fit the WW2 memorial beneath the original, this plain piece of alabaster was removed. 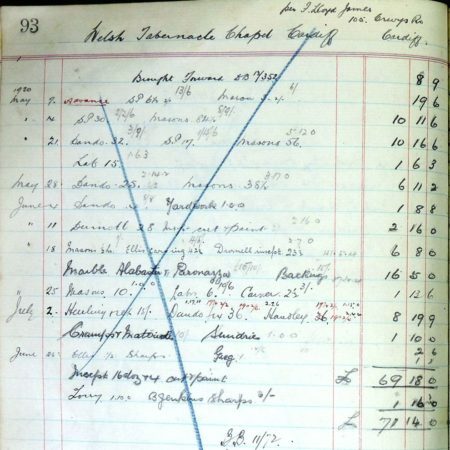 Day Book and Bill Book records are appended; Figures 4 and 5. 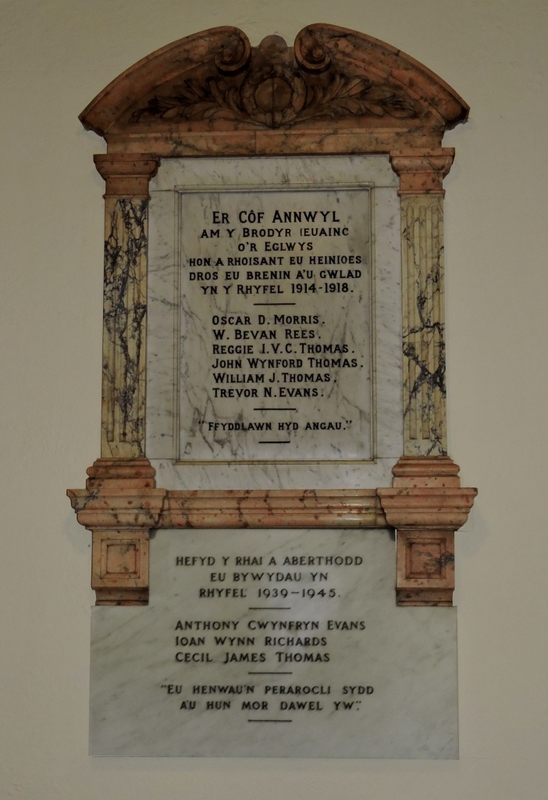 Thanks to Mike Clarke for access to his archive and Prof. Maddy Gray for help with Welsh translation. 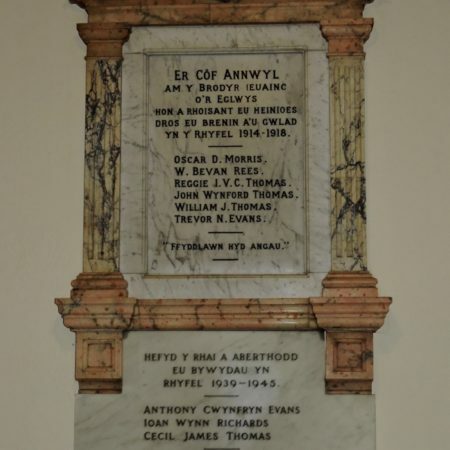 Quote from a poem/hymn ‘Gorffwys yn y Bedd’ (Rest in the Grave) by Evan Evans 1795-1873.